5 Ways to wish Mom a Happy Mother’s Day – with a little help from the kids | EmmaEats…and Katie too! 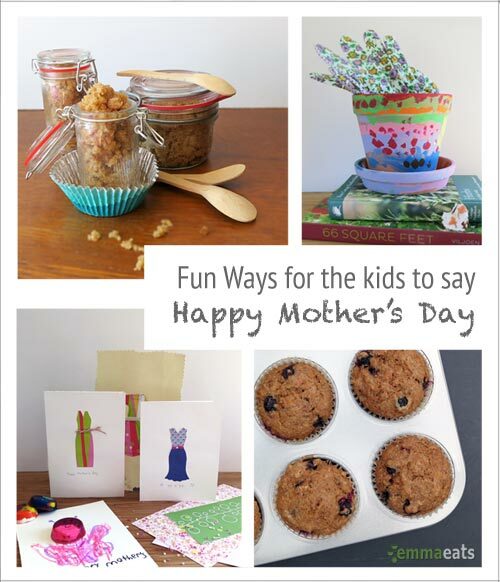 The sweetest Mother’s Day gifts tend to be homemade. It’s soon to be Mother’s Day and there are suggestions everywhere about all the things that Mom could want. Although it is always appreciated, many thoughtful gifts feel like they just add to the already insurmountable piles of stuff around the house. Then again, something personal, creative and handmade by her little darlings is a different story. Knowing the effort and love poured into something fashioned by the hands of children makes a lasting impression, even if the gift isn’t intended to last a long time. Here are 5 fun ways to wish Mom a Happy Mother’s Day. All can easily be made by the kids although they may look for a little help from an adult. Start the morning by letting Mom relax. Deliver a Handmade Designer Fashion Card uniquely designed by you along with breakfast in bed including these delectable Vegan Meyer Lemon Blueberry Muffins or with Bacon-Wrapped Eggs with Spinach and Cheese. After breakfast, together you can plant her favourite flowers from these pretty Origami Seed Packets in her newly Handpainted Terracotta Planter. And when all is done, she can relax in the bath and use the all-natural 4-ingredient Brown Sugar Coconut Body Polish made for her with love. Unleash the kids on their project for Mom. Let them show their appreciation for all she does. There will be many hugs and lots of kisses – and a very Happy Mother’s Day!